If the separate segregated fund (SSF) pays for an operating expenditure and the connected organization reimburses the committee, the SSF will report both the operating expenditure and the reimbursement. The reimbursement must take place no later than 30 calendar days after the expense was made. 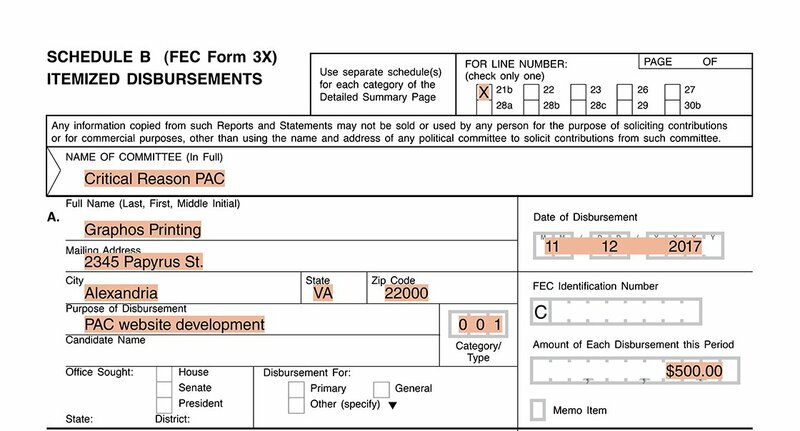 The committee reports spending $500.00 on developing a website on Line 21(b). It includes the vendor's name, Graphos Printing, address, date of disbursement, and the amount spent. 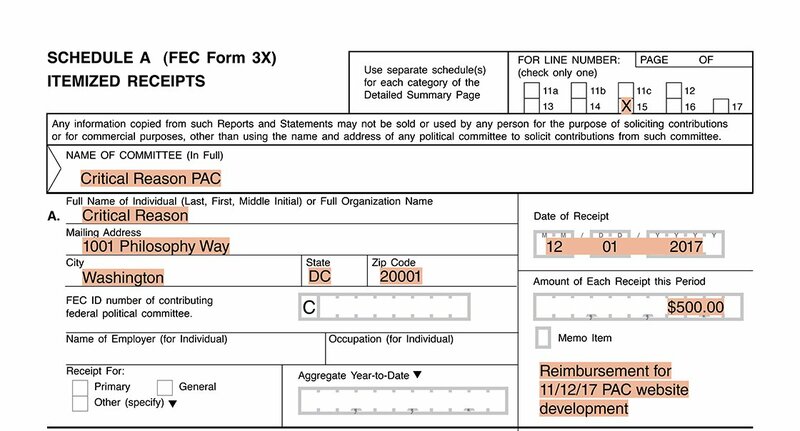 The committee also includes a clear purpose of disbursement, "PAC website development." SSFs report receiving the reimbursement from their connected organization in the “Offsets to Operating Expenditures” category on Form 3X, Line 15. The reimbursement must take place no later than 30 calendar days after the expense was made. The SSF’s connected organization, Critical Reason, reimbursed the PAC for the $500 spent on developing the website. On Line 15, the SSF discloses Critical Reason, address, date of reimbursement, and the amount spent. The committee also includes a clear notation, "Reimbursement for 11/12/17 website development."